I’m still alive and still running, though I’ve been trying to do more strength training this week. Just wanted to pop in and say some random things that are on my mind and have nothing to do with running. #1: I am addicted to Bunny Grahams. 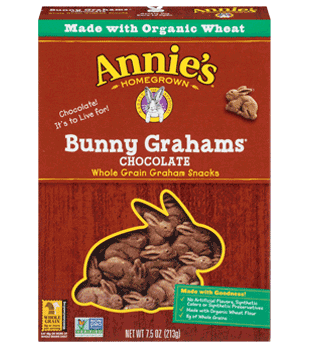 Bunny Grahams are an organic version of Teddy Grahams. I love Teddy Grahams. I love Bunny Grahams more. I saw these at Whole Foods a couple weeks ago and then found them at Publix (a lot closer to my house), which is really bad since I am now addicted to them (the chocolate ones, obviously) and like to eat an entire box in one sitting. I’m afraid I’m going to have to ban them from my grocery cart, just like Oreos. #2: Steven Spielberg better not ruin “Ready Player One”. Because I love that book. It was announced this week that he would be directing it, and while I’m not sure Spielberg has ever “ruined” anything (although I didn’t ever see that last Indiana Jones movie…), I will remain wary about any book-turned-movie that happens to be a book I adore. #3: I’m trying to declutter my house using the KonMari Method. Last weekend I read “The Life-Changing Magic of Tidying Up: The Japanese Art of Decluttering and Organizing” by Marie Kondo and now I have an entire upstairs bedroom covered in every article of clothing I own. I started this on Monday but then Tuesday through Thursday I was too sore to climb the stairs (thanks, Lower Fix) so I haven’t gotten very far yet, but I’m hopeful. This entry was posted in Personal and tagged konmari method. Bookmark the permalink. I’m going to need to look for that decluttering book, I need to do that to my whole house! I love Teddy Grahams too, but haven’t had them in ages! It’s going to be a long process to declutter but it’s going to be so worth it!